Here, we provide an optimized protocol for the isolation and cloning of the scarce T-cell entity of peripheral Vδ1+CD4+ T cells that is, as we showed recently, an extrathymic αβ T-cell progenitor. This technique allows to quantitatively isolate, clone and efficiently expand these cells in ex vivo culture. Welker, C., Handgretinger, R., Schilbach, K. Isolation and Ex Vivo Culture of Vδ1+CD4+γδ T Cells, an Extrathymic αβT-cell Progenitor. J. Vis. Exp. (106), e53482, doi:10.3791/53482 (2015). The thymus, the primary organ for the generation of αβ T cells and backbone of the adaptive immune system in vertebrates, has long been considered as the only source of αβT cells. Yet, thymic involution begins early in life leading to a drastically reduced output of naïve αβT cells into the periphery. Nevertheless, even centenarians can build immunity against newly acquired pathogens. Recent research suggests extrathymic αβT cell development, however our understanding of pathways that may compensate for thymic loss of function are still rudimental. γδ T cells are innate lymphocytes that constitute the main T-cell subset in the tissues. We recently ascribed a so far unappreciated outstanding function to a γδ T cell subset by showing that the scarce entity of CD4+ Vδ1+γδ T cells can transdifferentiate into αβT cells in inflammatory conditions. Here, we provide the protocol for the isolation of this progenitor from peripheral blood and its subsequent cultivation. Vδ1 cells are positively enriched from PBMCs of healthy human donors using magnetic beads, followed by a second step wherein we target the scarce fraction of CD4+ cells with a further magnetic labeling technique. The magnetic force of the second labeling exceeds the one of the first magnetic label, and thus allows the efficient, quantitative and specific positive isolation of the population of interest. We then introduce the technique and culture condition required for cloning and efficiently expanding the cells and for identification of the generated clones by FACS analysis. Thus, we provide a detailed protocol for the purification, culture and ex vivo expansion of CD4+ Vδ1+γδ T cells. This knowledge is prerequisite for studies that relate to this αβT cell progenitor`s biology and for those who aim to identify the molecular triggers that are involved in its transdifferentiation. In vertebrates, adaptive immunity that is structured in the cellular and a humoral part of immunity plays a major role in the defense against pathogens. The recognition of a wide range of antigens is mediated by hyperpolymorphic T- and B cell receptors (TCR/BCR), which with regard to T cells are assumed to be produced mainly in the thymus1. Thereto, hematopoietic stem cells (HSCs), derived from bone marrow, seed the thymus and differentiate along well-defined stages finally giving rise to all T cell lineages. Thymus seeding progenitors are CD4- and CD8- and thus constitute the immature, double negative (DN) thymocyte fraction. Thymus-derived signals then induce their lineage commitment and the differentiation into either αβ or γδ T cells. The expression of functionally rearranged TCR-γ and TCR-δ chain genes in DN2/3 thymocytes leads to γ δTCR complexes, which drive cellular proliferation and promote differentiation into γ δT cells2,3. In contrast, the rearrangement of a functional TCR-β chain, that can pair with preTα to build a preTCR pT, induces the transcriptional silencing of the TCR-γ chain in DN3 thymocytes and their transition into CD4+CD8+ double-positive thymocytes4. At this stage, recombination of the TCR-α chain occurs, deleting the TCR-δ locus that nestles within the TCR-α locus, thus abrogating the production a γδTCR in these cells irrevocably5-9. Rearranged αβTCRs are subsequently selected for their ability to bind self-MHC weakly (positive selection), which may not exceed a certain threshold to avoid autoimmunity (negative selection). According to their capacity of binding MHC class I or II, the selected αβT cells develop into single-positive CD4+ or CD8+ T cells, which exit the thymus as naïve T cells. However, involution of the thymus starts early in life leading to exponentially reduced output of naïve T cells that is almost extinguished post-adolescence10. Nevertheless, the size of the T cell pool remains constant throughout life, which can be explained only in part by post-thymic homeostatic proliferation of T cells and the proliferation of long-lived immunologic memory11. Consequently, extrathymic T cell development must occur. Recent research has gained substantial attraction that characterized αβT cell progenitors, which-at extrathymic sites-gave rise to functional αβ T cells12-17. Yet, detailed knowledge about extrathymic αβT cell precursors that independent from a thymus differentiate into αβT cells is as fragmentary as the background that we have on the route they take thereby. We recently identified the small T-cell entity of Vδ1+ CD4+γδT cells as an extrathymic αβT cell prognitor18, which when isolated from peripheral blood of healthy human donors can transdifferentiate into αβT cells in a mild inflammatory environment. Interestingly and contrary to the homeostatic proliferation of post-thymic T cells, transdifferentiation of Vδ1 CD4+ cells generates new T cell receptors, thus broadening the repertoire diversity, so that potentially new antigens can be recognized and may protection the host against newly acquired pathogens. This adds to the plasticity of T cells and adds a so far unappreciated new pathway for extrathymic T cell development. The quantitative isolation from lymphocytic sources, the generation of single-cell clones and their efficient expansion are essential for the objective to identify those markers and molecules that trigger this αβT cell precursor`s extrathymic development. Ethic Statement: All procedures were carried out according to the Declaration of Helsinki and were approved by the Clinical Ethics Committee at the University of Tübingen (projects 38/2009B02 and 470/2013B02). Take 50-100 ml from a healthy volunteer via venipuncture using a 50 ml syringe containing 1,000 IU heparin sulfate and dilute the blood 1:2 with PBS (pH = 7.2). Carefully layer 35 ml of the blood:PBS solution on 15 ml blood separating solution such as Biocoll (d = 1.077 g/ml) in a 50 ml conical tube. Centrifuge for 15 min at 800 x g at RT. NOTE: Brake must not be used. Collect the cells of the lymphocytic layer with a pipette and wash the cells twice in at least 50 ml PBS (centrifuge for 12 min; at 400 x g). Remove the supernatant after centrifugation with a pipette. Lyse remaining erythrocytes by suspending and incubating the lymphocytic fraction with 1-5 ml of a hypotonic buffer solution for 2-4 min. NOTE: Duration of exposure and volume of lysing buffer depend on the used lysing buffer and on the amount of red blood cells left in the lymphocyte fraction. Dilute the cells with PBS (1:10) and centrifuge at 250 x g for 12 min and subsequently resuspend and wash the cell pellet once in 10 ml PBS at 300 x g for 12 min. Resuspend the lymphocytes in PBS and count the cells in a Neubauer counting chamber using Trypan blue solution. NOTE: Usually, >1 x 108 lymphocytes are received from 100 ml freshly drawn peripheral blood. Take <1 x 106 isolated lymphocytes for an initial FACS determining the frequency of Vδ1 CD4 T cells. NOTE: Population size of this T-cell entity may differ greatly between individuals and according to their immunologic state. Typically, about 1% of T cells are Vδ1+ and about 1-5% of Vδ1+ cells are CD4+. Dilute the cells with 1 ml FACS-buffer, which consists of PBS containing 2% FCS and 5 mM EDTA. Centrifuge at 660 x g for 2 min and decant the supernatant. The reflux volume of about 100 µl FACS buffer is sufficient for the subsequent staining. Briefly vortex and incubate the cells with 5 µl Fc-Blocking Reagent for 5 min at RT for increased specificity of the FACS staining. Add human monoclonal antibodies directly to the cells without removing the Fc-Blocking Reagent. Make sure to stain the cells with antibodies against Vδ1 (1:50), CD3 (1:50), CD4 (1:200), CD8 (1:200) and TCRαβ (1:25). Prepare the isotype control with the corresponding immunoglobulin isotypes. Incubate cells with antibodies for 20 min at 4 °C in the dark. Wash the cells in 1 ml FACS buffer (centrifuge for 2 min; at 660 x g), decant the supernatant and proceed to FACS acquisition in the remaining buffer volume. Pelletize the cells (that are not used in the FACS analysis) by centrifugation for 12 min; at 300 g; 8 °C. Remove the supernatant and resuspend the cell pelletin 60 µl MACS-buffer per 1 x 107 cells. Add 20 µl Fc-Blocking Reagent per 1 x 107 cells and incubate for 5 min at 4°C. Add 10 µl FITC-conjugated anti-human Vδ1 antibody per 1 x 107 cells directly to the cells. Incubate for 12 min at 4 °C in the dark. Wash the cells using 14 ml MACS-buffer (centrifuge for 12 min; at 300 g; 8 °C). Discard supernatant completely and resuspend the cells in 80 µl MACS buffer per 1x107 cells. Take 1-2 x 105 cells and dilute them in 100 µl FACS buffer for verification of the labeling by FACS analysis. No further additives are needed for this step. Make sure that there is a sufficient difference in the brightness for Vδ1- and Vδ1+ cells. If this is not the case, repeat steps 2.3) and 2.4). Add 20 µl anti-FITC microbeads per 1 x 107 cells to the remaining cells, mix well and incubate for 15 min in the dark at 4 °C. Thereafter, wash the cells using at least 10 ml MACS buffer (centrifuge for 12 min, at 300 x g; 8 °C). During the centrifugation, equilibrate the pre-cooled magnetic column placed in a magnet with 500 µl MACS buffer. Resuspend the cells in 500 µl MACS-buffer (for cell numbers higher than 1 x 108, scale up this volume accordingly) and apply the cells carefully onto the column. Collect the flow-through containing the Vδ1- cells. Wash the column three times with 500 µl MACS-buffer and collect the flow-through again in the same tube. Note that the reservoir must be empty before applying buffer onto the column. Remove the column from the magnetic device and place it into a 15 ml conical tube. Quickly flush the column with 1 ml MACS buffer by firmly pushing the plunger into the column. Collect the eluate in a tube. NOTE: In order to obtain a purity of >98%, it is usually necessary to repeat steps 2.7-2.9) with a second column. Verify the purity of the cells by FACS analysis18 with the same antibody panel as before (see 2.1.2) and count the cells. Resuspend 25 µl of CD4 beads with a vortex for >30 sec. Wash the beads (the minimum amount as depicted by the manufacturer) in 1 ml MACS buffer in a 1.5 ml reaction tube by placing the tube into a magnet for 1 min. Discard the supernatant carefully with a small-scale pipette (200 µl) and resuspend the beads in the original volume of MACS-buffer. Pelletize Vδ1+ cells (centrifuge for 12 min; at 300 x g) and aspirate the supernatant and resuspend all the Vδ1+ cells in 500 µl MACS-buffer and add them to the tube containing the beads. Mix vigorously and incubate for 20 min at 4 °C with constant tilting (e.g., in a rotator). Place the tube containing the cells in a magnet for 2 min. Make sure that there are no remnants in the lid. NOTE: CD4+ cells will have bound the magnetic beads and attach to the side of the tube facing the magnet. Carefully open the lid while keeping the tube inside the magnetic device and collect the supernatant which contains the CD4- Vδ1+ cells using a small-scale pipette. Place CD4- Vδ1+ cells into a separate tube and place this tube into the magnet again to avoid possibly remaining CD4 cells or beads from the population. Wash the CD4- cells in 5 ml MACS-buffer (centrifuge for 12 min; at 300 x g) and resuspend them in a concentration of 1 x 105 cells per 100 µl media. CD4- cells can be readily cultivated under the conditions given below (4.2). Resuspend the CD4+ cells in 100 µl culture media (RPMI 1640, 10 % FCS, 1% L-Glutamine, 1% Penicillin/Streptomycin) and add 10 µl of a bead-detaching solution. Incubate at RT for 45 min with constant tilting (e.g., in a rotator). Place the cells in a magnet for 1 min. Carefully collect the supernatant containing bead-free Vδ1+CD4+ cells using a small-scale pipette. Outside of the magnet, resuspend the beads with 100 µl culture media and repeat steps 3.6 and 3.7 twice to obtain higher cell numbers of CD4+ cells. Pelletize the cells (centrifuge at 300 x g, for 12 min) and discard the supernatant completely by pipetting. Resuspend cells in fresh, pre-warmed media and count them. Examine the purity of the Vδ1+CD4+ cells by FACS analysis depicted in steps 2.1.1-2.1.3. Isolate peripheral blood mononuclear cells (PBMCs) from an allogeneic donor as depicted in 1.1-1.6. Irradiate 2.5 x 107 allogeneic PBMCs with 80 Gy in 25 ml culture media using γ-radiation. Add IL-2 (200 U/ml), IL-7 (20 ng/ml) and PHA (2 µg/ml) to the irradiated feeder cells and distribute them in 96-well U-form plates, 5 x 104 feeder cells in 50 µl per well. Dilute the Vδ1+ CD4+ cells to a concentration of 0.3 cells per 50 µl. Pipette 50 µl of the cell solution to each well harboring the irradiated cells and cytokines. NOTE: Thus, the cytokines are diluted to the final concentration of 100 U/ml IL-2, 10 ng/ml IL-7 and 1 µg/ml PHA. Incubate the 96-well plates in an incubator at 37 °C, 5% CO2 humidified atmosphere. Optionally, cultivate remaining purified Vδ1+ CD4+ cells as bulk culture under the same culture conditions as the clones. Supply the cells every 3-4 days with cytokines and fresh media. For this, exchange half of the medium in the wells with 50 µl fresh medium by pipetting. Add 2-fold concentration of cytokines to every supplementation. Add 5x104 irradiated feeder cells per well every other round of feeding. Using a microscope, observe first clones become visible after 3-4 weeks, as they metabolize and thus change the color of the culture medium and form colonies. NOTE: For further cultivation, resuspend the clones well and transfer them to separate 96-well plates. Analyze the cells via FACS as indicated in 2.1.1-2.1.3. Clones kept under these conditions may eventually change their TCR from Vδ1 to αβTCR. The time point for this transdifferentiation varies from clone to clone. Figure 1 depicts the different stages and the outcome of the isolation of Vδ1 T cells from peripheral blood. Figure 1A shows a typical distribution of Vδ1+ cells in CD3+ lymphocytes, as well as the co-receptor expression of the Vδ1+ population. In this donor, the frequency of Vδ1+ cells (red) is 2.3% of total lymphocyte counts and the CD4 expression (green) of Vδ1+ lymphocytes is 2.6%. Altogether, the target population for isolation represents 0.06% of total lymphocytes in this donor. Figure 1B shows an optimal staining intensity for Vδ1+ cells before proceeding to the magnetic labeling. Staining with the primary antibody should result in clearly distinct Vδ1negative and Vδ1positive populations so that the Vδ1+ cells can efficiently be labeled and separated with the magnetic beads. Figure 1C depicts Vδ1+ cells after the isolation procedure by FACS analysis. The purity of Vδ1+ is usually >99% of CD3+ cells. To increase purity, isolated cells are applied onto a second isolation column. This results in considerable cell loss however this steps leads to quantitative elimination of potentially contaminating TCRαβ + CD4+ cells. The results of the CD4+ isolation are shown in Figure 2. Due to the low numbers of CD4+ Vδ1+ cells, and since the cells are expanded in a limited dilution single-cell cloning approach purity of CD4+ cells less than 100% can be tolerated. 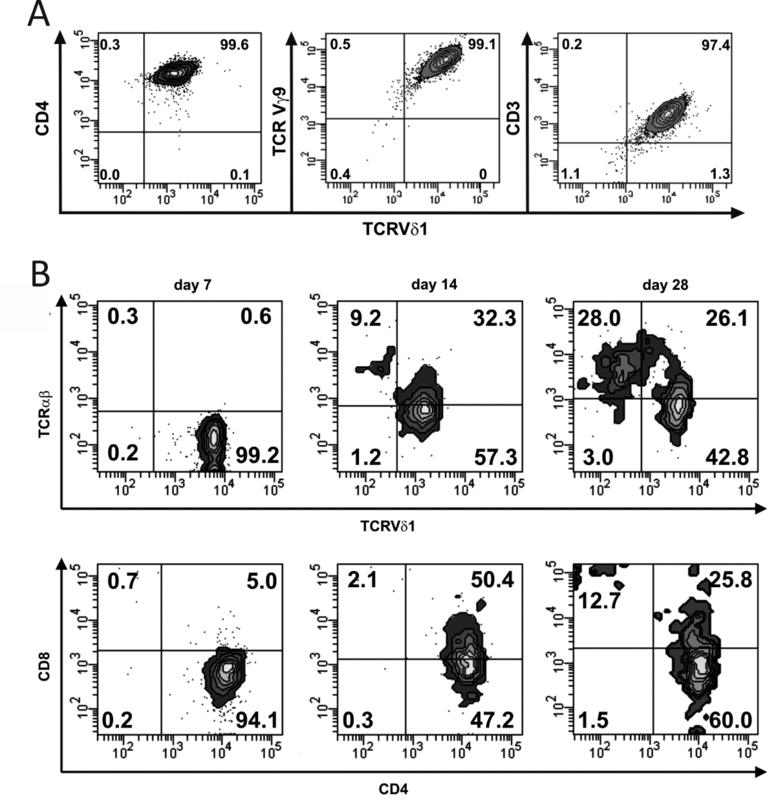 In the experiment shown here, the purity of the Vδ1+CD4+ cells was about 90% (Figure 2A, right blot) and subsequent single-cell cloning resulted in more than 60 Vδ1+CD4+ T cell clones. Contrarily, in the Vδ1+CD4- fraction no CD4+ cells remained (Figure 2B), which highlights the efficiency of this isolation strategy. Of note, the CD4+ cells (blue) express Vδ1 at a distinguishable lower level than CD4- cells (red) (Figure 2A, both blots). 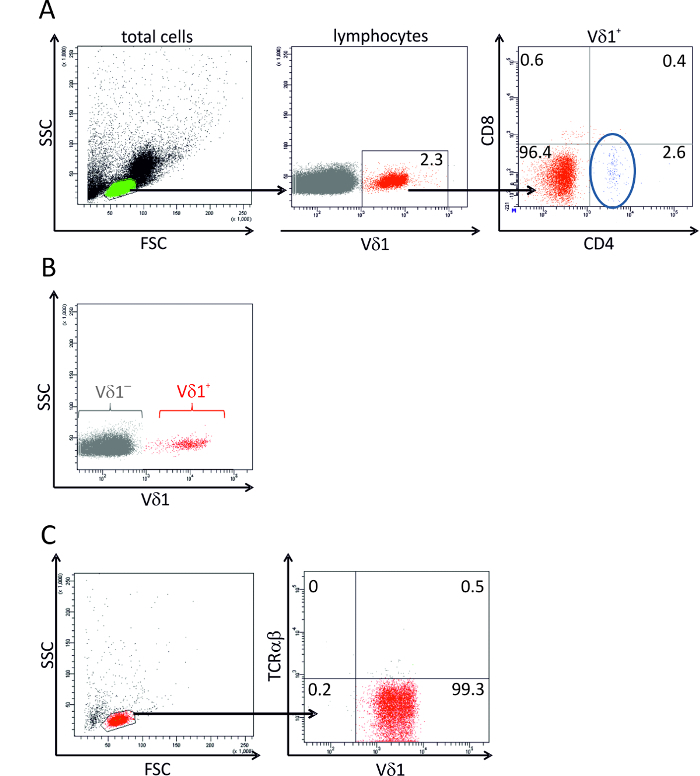 Thus, staining of Vδ1+ cells must be excessive-as described in the protocol-for a sufficient labeling and successful isolation of the CD4+ fraction within the Vδ1+ T cell pool. In Figure 3A, the typical phenotype of an emerging clone is presented. The TCR is composed of a Vδ1 and a Vγ9 chain and the clonal cells express CD3 and CD4. Figure 3B depicts the process of transdifferentiation of one clone isolated with the presented technique. Transdifferentiation includes the downregulation of the V´1-chain to a low expression level, which is paralleled by the de novo expression of an αβTCR. This leads to a transient TCR-double-positive phenotype which eventually gives rise to single-positive αβTCR-expressing T cells. The co-receptor expression may also change during the course of transdifferentiation. Similar to thymocytes, a CD4+CD8+ DP phenotype may occur, which eventually develops into either SP CD4+ or CD8+ αβ T cells. Under the culture conditions presented here, transdifferentiation is a rare event-only one out of 50 clones changed their Vδ1+ TCR into αβTCR. Figure 1. 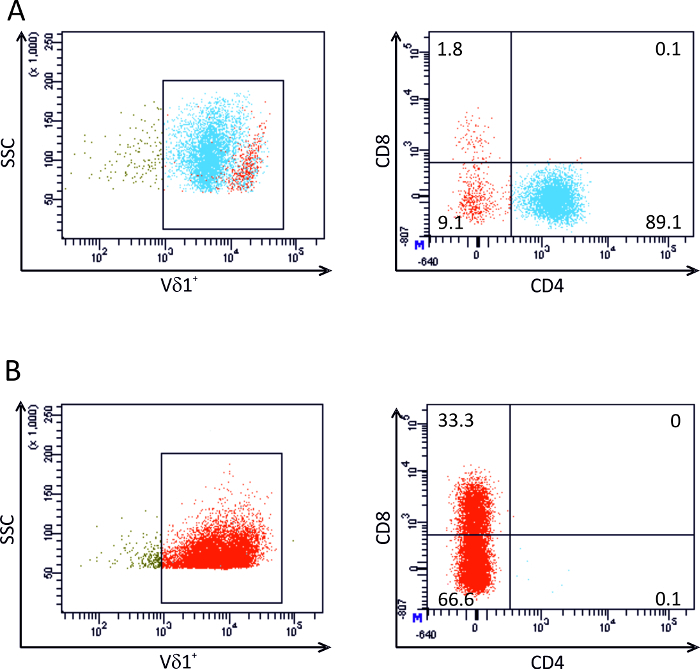 FACS analyses monitoring all stages of the isolation process of Vδ1 T cells from peripheral blood. (A) Distribution of Vδ1+ cells (red) in CD3+ cells of peripheral blood lymphocytes and their co-receptor expression. CD4+ Vδ1+ cells are indicated in blue (circle). (B) Staining of the Vδ1 fraction before proceeding to magnetic labeling. (C) FACS analysis of Vδ1+ cells of positive fraction after isolation. Numbers indicate percentage of gated cells. Please click here to view a larger version of this figure. Figure 2. FACS analyses of Vδ1 CD4+ isolates. (A) CD4+ fraction and (B) CD4- fraction after CD4+ cell isolation. Numbers indicate percentage of gated cells. Please click here to view a larger version of this figure. Figure 3. Phenotypic analysis of a clone right after detection. (A) TCR composition and co-receptor expression of a freshly isolated clone. Vδ1 and Vγ9 TCR is co-expressed with CD3 and CD4. (B) Process of transdifferentiation in a CD4+ Vδ1+ clone. Change of TCR expression (top), and change of co-receptor expression (bottom)18. Please click here to view a larger version of this figure. To study the phenotype, biology and function of a scarce (T-) cell entity, namely Vδ1+CD4+ T cells, we used two markers: Vδ1 and CD4 for its positive magnetic cell isolation. Vδ1 is an orphan receptor, whereas CD4 is expressed on T helper cells, at a lower level on monocytes and dendritic cells, and at a very low level on hematopoietic progenitor cells. Techniques for the enrichment and selection of cells in high purity include Fluorescence activated cell sorting (FACS), a technique that separates a population of cells into sub-populations based on fluorescent labeling. Cells stained using fluorophore-conjugated antibodies can be separated from one another depending on which fluorophore(s) they have bound. Sorters can achieve purity close to 98%19, which is useful if the only necessity is the sorting itself. Drawbacks of this technique include that sorted cells show a decrease in cell viability, and in our target population also a reduced potential for transdifferention. A reduced cell viability after sorting is hypothesized to be due to the shearing forces and hydrodynamic stress that the FACS imposes upon cells. Moreover, to keep cells viable and without contamination for subsequent culture, the experiment should be undertaken in aseptic sterile conditions which is hard to manage. In addition, FACS sorting recommends high numbers of cells for sorting. Isolation Kits have been developed from several companies for direct magnetic labeling and the sorting of cells according to multiple surface markers. Their strategy relies on the removal of the magnetic label from the cells after the first sort by using a release reagent, which either enzymatically or competitively removes the magnetic label from the structure to which it was bound. This allows a second magnetic labeling and separation of the cells for another surface marker of interest that is achieved by using either direct or indirect labeling with magnetic beads. Removal of the label recommends working at low temperatures (on ice, at 2-8 °C) for extended periods of time, exposure to a chemical and repeated washing steps. If the target cells of the second parameter separation are present in a low concentration after selection (<10% target cells in the positive fraction after the first separation) even a second round for removal ofany residual magnetically labeled cells is needed. This procedure is-besides having a substantial loss of target cells due to repeated washing steps-at high risk for inducing cellular damage and loss of function due to mechanical and physiological stressors. Compared with FACS sorting however cell preparations remain sterile and smaller cell numbers can be sorted. The strategy that we pursue combines two consecutively executed positive selections, yet the removal of the first label is not required as the magnetic labels differ in the magnitude of their magnetic forces by several log phases. While the first anti-fluorochrome magnetically-labeled bead type is small, with a diameter of 50 nm, the second anti-fluorochrome magnetically-labeled bead type measures 1 to 4.5 µm, thus exceeding the volume/strength of the first magnetic label 20 to 90-fold. Additionally, the second positive sort omits cell stress, that is associated with magnetic column retention/release as cells remain in an 1.5 ml vial that is put in a magnetic device so that labeled cells are attached to the wall of the vial. Washing procedures can be kept on a small scale. This elaborated protocol reduces cell loss and increases cell viability since cells experience less manipulation and pass the isolation process faster than protocols using multisort isolation kit systems. Consequently, this protocol allows to separate even a small number of cells and another advantage: sorted cells remain sterile throughout the procedure. Subsequent cloning experiments using limiting dilution allows the efficient expansion of individual members of the isolated cells, here the very scarce Vδ1+CD4+γδ T cell entity18. Sorted cells show excellent viability and clonogenicity and remain fully functional. For future applications, use this strategy to quantitatively select and successfully purify small T cell entities from diverse human sources including freshly drawn peripheral blood, (mobilized) leukapheresis products, cord blood and bone marrow by combining two consecutively performed positive selections using magnetic labels that differ by magnitude in their magnetic forces and thus retention capacity. Christian Welker is funded by a grant provided by the Jürgen-Manchot-Stiftung. Bhandoola, A., von, B. H., Petrie, H. T., Zuniga-Pflucker, J. C. Commitment and developmental potential of extrathymic and intrathymic T cell precursors: plenty to choose from. Immunity. 26, (6), 678-689 (2007). Von, B. H., Melchers, F. Checkpoints in lymphocyte development and autoimmune disease. Nat. Immunol. 11, (1), 14-20 (2010). Prinz, I., et al. Visualization of the earliest steps of gammadelta T cell development in the adult thymus. Nat. Immunol. 7, (9), 995-1003 (2006). Ferrero, I., et al. TCRgamma silencing during alphabeta T cell development depends upon pre-TCR-induced proliferation. J. Immunol. 177, (9), 6038-6043 (2006). Krangel, M. S., Carabana, J., Abbarategui, I., Schlimgen, R., Hawwari, A. Enforcing order within a complex locus: current perspectives on the control of V(D)J recombination at the murine T-cell receptor alpha/delta locus. Immunol. Rev. 200, 224-232 (2004). Hawwari, A., Krangel, M. S. Role for rearranged variable gene segments in directing secondary T cell receptor alpha recombination. Proc. Natl. Acad. Sci. U.S.A. 104, (3), 903-907 (2007). Hawwari, A., Krangel, M. S. Regulation of TCR delta and alpha repertoires by local and long-distance control of variable gene segment chromatin structure. J. Exp. Med. 202, (4), 467-472 (2005). Hawwari, A., Bock, C., Krangel, M. S. Regulation of T cell receptor alpha gene assembly by a complex hierarchy of germline Jalpha promoters. Nat. Immunol. 6, (5), 481-489 (2005). Hager, E., Hawwari, A., Matsuda, J. L., Krangel, M. S., Gapin, L. Multiple constraints at the level of TCRalpha rearrangement impact Valpha14i NKT cell development. J. Immunol. 179, (4), 2228-2234 (2007). Linton, P. J., Dorshkind, K. Age-related changes in lymphocyte development and function. Nat. Immunol. 5, (2), 133-139 (2004). Sprent, J., Tough, D. F. Lymphocyte life-span and memory. Science. 265, (5177), 1395-1400 (1994). Guy-Grand, D., et al. Extrathymic T cell lymphopoiesis: ontogeny and contribution to gut intraepithelial lymphocytes in athymic and euthymic mice. J. Exp. Med. 197, (3), 333-341 (2003). McClory, S., et al. Evidence for a stepwise program of extrathymic T cell development within the human tonsil. J. Clin. Invest. 122, (4), 1403-1415 (2012). Jbakhsh-Jones, S., Jerabek, L., Weissman, I. L., Strober, S. Extrathymic maturation of alpha beta T cells from hemopoietic stem cells. J. Immunol. 155, (7), 3338-3344 (1995). Garcia-Ojeda, M. E., et al. Stepwise development of committed progenitors in the bone marrow that generate functional T cells in the absence of the thymus. J. Immunol. 175, (7), 4363-4373 (2005). Arcangeli, M. L., et al. Extrathymic hemopoietic progenitors committed to T cell differentiation in the adult mouse. J. Immunol. 174, (4), 1980-1988 (2005). Maillard, I., et al. Notch-dependent T-lineage commitment occurs at extrathymic sites following bone marrow transplantation. Blood. 107, (9), 3511-3519 (2006). Ziegler, H., et al. Human Peripheral CD4(+) Vdelta1(+) gammadeltaT Cells Can Develop into alphabetaT Cells. Front Immunol. 5, 645 (2014). Mollet, M., Godoy-Silva, R., Berdugo, C., Chalmers, J. J. Computer simulations of the energy dissipation rate in a fluorescence-activated cell sorter: Implications to cells. Biotechnol Bioeng. 100, (2), 260-272 (2008).